Boston University hosts Holy Cross before taking on Harvard on Tuesday night in search of its first Beanpot title since 1981. - Boston University looks to sweep its regular season series with Holy Cross when they host them for their third and final game on Saturday afternoon, before taking on Harvard on Tuesday night in search of its first Beanpot title since 1981. - The Terriers are currently riding a nine-game unbeaten streak after posting a 1-0-1 record in their last two games. They downed Vermont, 7-2, on Friday to take a 2-0-1 record against the Catamounts this season. Brian Durocher's squad then advanced past #3 Northeastern in the opening round of the Beanpot after playing the Huskies to a 3-3 overtime draw and outscoring them in 2-1 in shootout. - Sammy Davis (Pembroke, Mass.) recorded seven points in the two games last week, finding the back of the net twice and dishing out five assists en route to extending her point streak to five games. The junior now has 13 points (5g, 8a) in that span. - Holy Cross heads into its only game of the weekend after being shutout, 6-0, by Boston College on Friday and coming up short in a 2-1 loss to Vermont on Sunday. - Maine plays host to Providence for two games over the weekend to close out their regular season Hockey East series. The two teams met for the first time back on Nov. 9, a 3-1 Friars win. - The Black Bears are back on home ice after visiting New Hampshire. They fell to the Wildcats, 5-2, on Saturday, before dropping a 3-2 decision on Sunday. - Providence most recently won two Hockey East season-long series. The Friars played to a 2-2 overtime draw with Merrimack on Friday, finishing with a 2-0-1 record against the Warriors, before defeating UConn, 3-1, to take that series, 2-1-0. - Friars senior Emily Landry (Orangeville, Ont.) recorded a goal in each game over the weekend, including the game-winning tally in Saturday's victory over the Huskies. - UConn welcomes Vermont for two games to finish the Hockey East series that began on Oct. 6 at Gutterson Fieldhouse. The Huskies skated away with a 4-2 victory in that outing. - The Huskies look to end a six-game slide, most recently dropping a 2-1 overtime decision against #3 Northeastern and a 3-1 setback at Providence. - Vermont hits the road again, in the middle of a swing where they play five of six on the road. Most recently, the Catamounts dropped a 7-2 decision in their final regular season meeting with Boston University, before rebounding to knock off Holy Cross, 2-1, to end a five-game losing streak. - Maude Poulin-Labelle (Sherbrooke, Que.) was named Pro Ambitions Rookie of the Week after contributing on each goal in the Catamounts win over the Crusaders on Sunday. The freshman assisted on the first goal of the game, before going on to net the game-winner. - The Eagles face off against the Wildcats on home ice Friday to mark their second meeting of the year, looking to even the season series after falling, 3-2, in their first meeting. 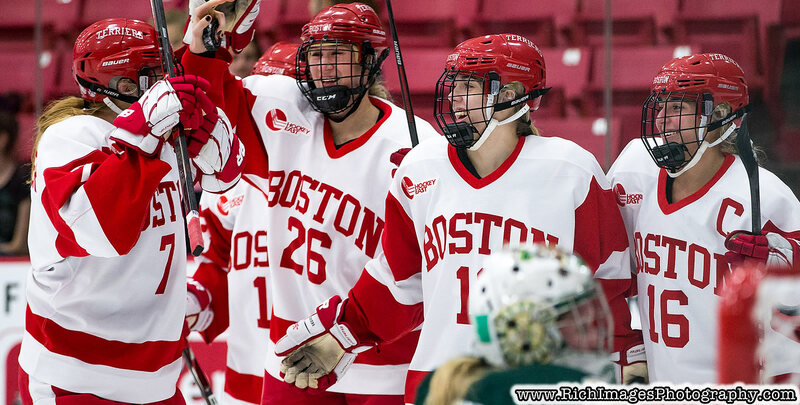 Katie Crowley's squad will then take on Northeastern in the third-place game of the Beanpot Tournament on Tuesday. This marks the fourth meeting between the two nationally-ranked teams this season, with NU holding a 2-1-0 advantage, and the first time since 2012 the Eagles have not appeared in the Beanpot title game. - Boston College goaltender Maddy McArthur (St. Catherines, Ont.) earned Hockey East Defensive Player of the Week honors on Monday after turning away all 16 Crusaders shots in the Eagles' 6-0 victory on Friday, earning her fifth shutout of the season. Her five perfect games on the year are tied for the national lead. - New Hampshire takes on Boston College for the second time this season, while Merrimack will kick off their three games series with Northeastern on the same night. The two teams will then meet on Saturday afternoon to close out their own regular season Hockey East series, with the Wildcats playing host and currently holding a 2-0-0 advantage over the visiting Warriors. - The Wildcats pushed their winning streak to five games after taking four points from Maine in league action last weekend. They defeated the visiting Black Bears, 5-2, on Saturday, before coming from behind to skate away with a 3-2 win on Sunday. - Taylor Wenczkowski (Rochester, N.H.) recorded four points (3g, 1a) in the weekend sweep, earning Hockey East Player of the Week honors for her efforts. The junior netted three goals, including the game-winner in each game. - Northeastern hits the ice with Merrimack on Friday night for the first of three meetings with the Warriors this year. They Huskies posted a 2-1-0 record against Merrimack in regular season play last season. On Tuesday, the Huskies will take on Boston College for the fourth time this season, this time in a non-conference game, in the third place game of the Beanpot Tournament. - The Huskies closed out their regular season series against the other Huskies of Hockey East, defeating UConn, 2-1, in overtime to earn the regular season series sweep. Skylar Fontaine (East Greenwich, R.I.) assisted on the game-tying goal with just under a minute and a half to go in the third to force the extra frame and then went on to find the back of the net to seal the overtime victory. - On Tuesday, Northeastern's efforts came up short in the opening round of the Beanpot Tournament. The Huskies played Boston University to a 3-3 tie through the extra frame, before being outscored by the Terriers, 2-1, in a shootout that decided who would advance on to the championship game. Reagan Rust (South Haven, Miss.) netted the shootout goal to lift BU to its second straight Beanpot title game.